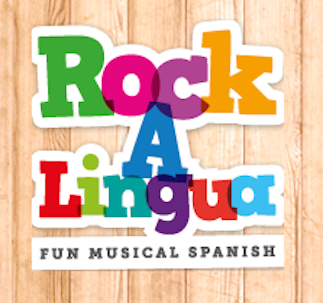 Rockalingua is an educational website with songs, videos and other materials to teach Spanish to children in the elementary grades. It was created by a musician and Spanish teacher from Spain who currently teaches in San Francisco. Rockalingua is giving away two one-year subscriptions to Spanish Playground readers. Rockalingua songs are very fun, with a style and rhythm that is sure to appeal to kids. They also correspond to typical units covered in an elementary school curriculum. In addition to the songs, there are videos, games, lyric sheets and worksheets on the Rockalingua website. The Giveaway – This giveaway is now closed. Congratulations to the winners! – Enter in the comment section below by telling us what kind of materials you would most like to see on Rockalingua and Spanish Playground (readings, picture cards, games, classroom posters, worksheets, speaking activities, writing prompts, etc.). – You can also enter in the comments on the Facebook post for a double entry. – The giveaway ends Monday, March 3 at 11:59 pm. – Winners will be chosen using random.org and notified on Tuesday, March 4. – Read Spanish Playground Official Giveaway Rules for more information. I am looking for worksheets and games to keep my kids interested and perhaps for a Spanish speaking babysitter to use with them. My kids are interested in science, nature and learning about Latin American cultures! Thanks! I would like to see some games that can be played with the whole class and some tutorials on how to use the materials with maybe a video of actual teachers using the games with students. More videos would be great, and worksheets, too! Really, I can use any and all great Spanish resources. Thanks! I love song-videos because it allows the kids to visualize what they are hearing without the need for translation. Interactive iPad games (that don’t require java) would also help to engage the students. We are trying to decrease our paper copies, so any practice and interactive learning that we can provide to our kids via the iPads would be very beneficial. Also, having PDF files that have a URL would allow me to provide this information to students via a QR code and give them the opportunity to annotate these files via a PDF app. I would love more audio of real-life conversations to provide the students with more authentic listening opportunities. I would love more materials directed at all ages K-12!! Would love material for the 4-7 age group. Worksheets and videos/songs. Thanks. I am looking for engaging activities to do with my two boys ages 6 and 2. My older son is in a dual language program, so I need to help him build his comprehension and vocabulary. My Spanish is VERY limited, so I want resources that will help me with pronunciation. My sons love science experiments and all kinds of hands-on activities. We are a homeschooling family and have started incorporating Spanish into our “Morning Circle” Routine. Songs and poems have seemed to be the best way to get both of my children involved and interested (ages 3 and 6). So I am always looking for simple songs and poems that we can repeat often! Thank you. I love the songs and videos and would love to see more of those. Also more worksheets, I teach 3-6 yr old so worksheets geared to that age would be great! Rockalingua has a lot of great songs. I would like more about places: planets, continents, types of terrain, types of shops, places around town. Thanks for supporting los hispanohablantes. Hardest materials for me to find are simple Spanish readers – especially at emergent reader level. Translations of English emergent readers don’t cut it !!! Where are the quality, fun materials – books, worksheets, games – that support those earliest decoders ? Songs that can be played on the smartboard that are catchy and have pictures to illustrate meaning. Simple language. Catchy music! I would like to see simple stories that go along with some of the awesome sons and themes. Love so much of your stuff already! Keep up the great work!! !